Intel graphics driver patches for Linux have revealed a couple of previously unannounced product news titbits. A patch from last week contained references to 14nm Intel Comet Lake-S processors with up to 10 cores. Yesterday another patch was released, this time with references to the 10nm Ice Lake and Elkhart Lake processors with Gen11 graphics. 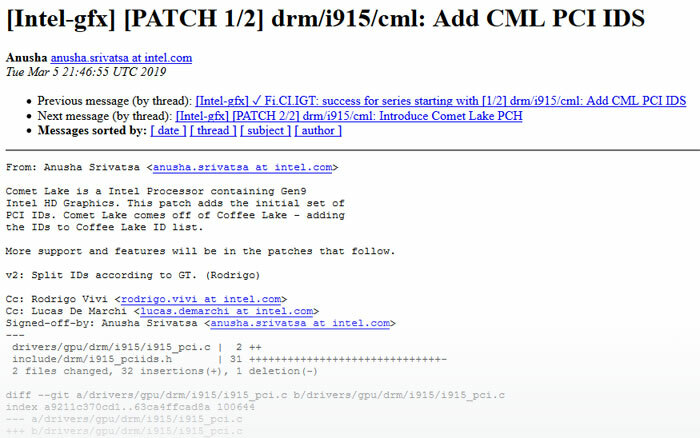 As reported by Guru3D, patches for Intel graphics drivers debuted with references to Comet Lake 'CML' support last week. It is noted that these are GT1 and GT2 graphics packing Comet Lake parts. Indications gathered from the Intel graphics driver patches point to laptop CML processors coming with up to six cores and desktop processors with 10 cores. These will (again) be 14nm ++ processors which use an enhanced Skylake microarchitecture. It looks like Comet Lake will be timed to be Intel's best effort to spoil AMD's Ryzen 3000 series desktop processor launch. However, AMD is expected to release its Zen-core packing desktop processors with 8, 12, and 16 cores to this mainstream desktop segment this summer. In a more recent Intel graphics driver patch for Linux, initial support for Elkhart Lake has been spotted. As Linux specialist site Phoronix reports, Elkhart Lake "isn't yet another 14nm CPU revision nor based on the long-standing 'Gen 9' graphics, but is an Icelake offshoot". We don't have much info about the 10nm Elkhart Lake 'EHL', the successor to the Gemini Lake SoC, but this driver seems to confirm it will come packing Gen 11 graphics similar to the Icelake processors. There are just four EHL graphics adapters listed with PCI Ids; 0x4500, 0x4571, 0x4551, and 0x4541. Phoronix reckons that graphics driver support code for EHL will make its way into Linux 5.2 this summer, in time for the SoC's debut a little later in the year. Ahh, Intel, you couldn't just hold off for a moment and take the hands of the skylake turd crank handle. Sure you miss out a tiny bit but you're just self insulting at this point of yet another skylake refresh. you know, they just woke from a slumber and as wake up they got beaten by spectre and other flaws. It will take time to develop new architecture. Not like they didn't deserve it.